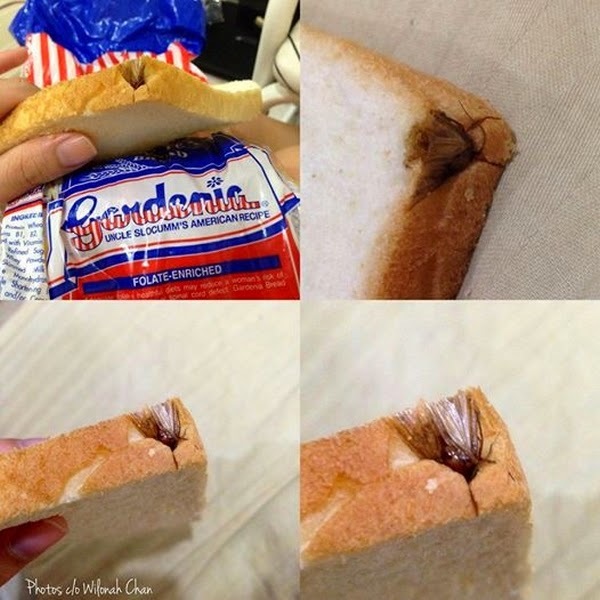 Businesswoman Wilonah Chan was shocked to discover a dead beetle-like bug in a slice of folate-enriched white bread that she was about to eat for breakfast over the weekend. Chan decided to express her disappointment in writing. However, due to lack of means to provide the company photos as proof, she turned to Facebook and posted her letter with a collage of images showing the disgusting add-on. The letter immediately garnered thousands of likes, shares, and comments. And just as quick as the post had gone trending, Chan was able to get a response from Gardenia. The company's social media team asked for her number and offered assistance. Many praised Chan for bringing her discovery to public attention, but there were some who criticized and even accused her of circulating a black propaganda that allegedly favored a competing product. For the record, once and for all, I did not post that open letter for FAME. That's for consumer awareness at dahil din dyan kaya ako na-contact ng Gardenia because I tried to call them before posting it but no luck. At around midnight on Sunday, Chan posted a photo showing a bowl of noodles paired with, guess what, Gardenia bread.